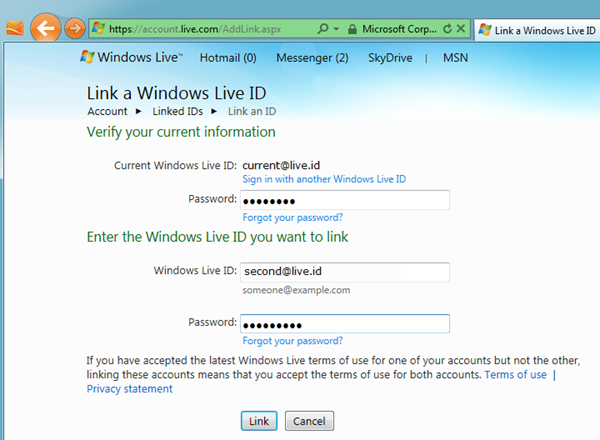 How do I link multiple Windows Live accounts? UPDATE – July 2013: Sorry folks, Microsoft no longer allows linking of accounts. The post below is no longer of use. Bummer. Windows Live with SkyDrive and Hotmail makes the “cloud” experience fast and easy. If you have more than one account, linking them makes switching between then a one-click operation. Many folks have more than one account, a personal one, and maybe a work-related account. Linking them makes switching easy, but does not affect the files or organization of either account. Each account still keeps all its settings and preferences, all the folder and album organization. Click on your name or move the pointer over the down-pointing arrowhead behind your name (top-right of window). See the illustration. On the drop-down menu click Account. Sign in to the page with your password. On the Account overview page, toward the bottom, in the Other options sections, click on the Linked IDs link. 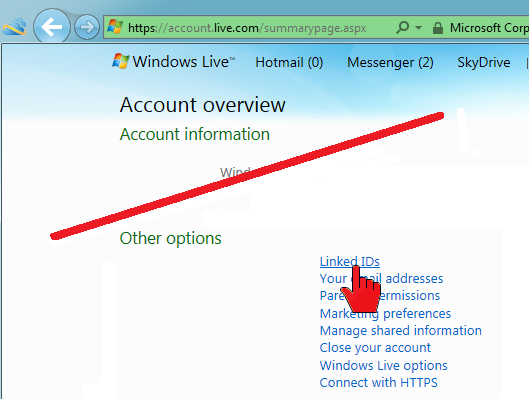 The Manage linked IDs page shows what accounts are linked and has an Add linked ID link. 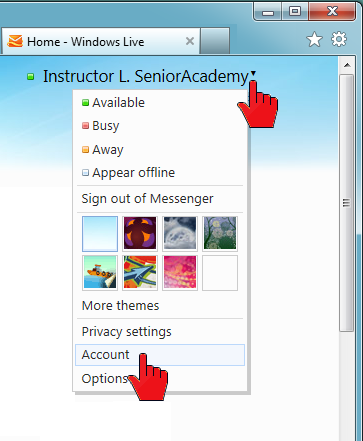 Click it to proceed to the Link a Windows Live ID page. Once more your password is needed. Type in the credentials for the account you wish to add. Then click Link. The Manage linked IDs page now shows the linked accounts. Note that there is an Unlink option to the right of each linked account name – you can unlink an account at any time. How do you switch accounts? With linked accounts all you need to do is click on your name or move the pointer to the down-pointing arrowhead behind your name. The drop-down menu will show the linked accounts at the bottom. The active, displayed, account is highlighted. Just click on another account and the switch is made. Note the other options on the drop-down menu. I like to assign different themes to my different accounts to keep myself reminded of which account I am in. I also set Keep me signed in on the sign-in page. 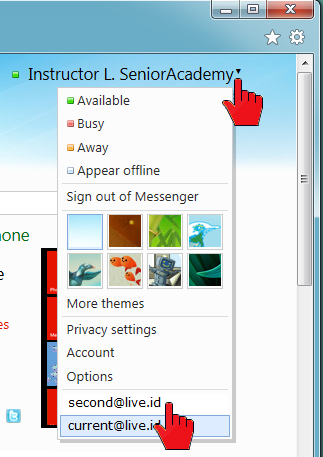 This way I do not need to sign in each time I want to visit SkyDrive or my mail.